With the Catholic faith, a marriage solemnized inside a church by a Catholic priest and witnessed by your family and friends is the total #WeddingGoals for most Filipino Catholics. 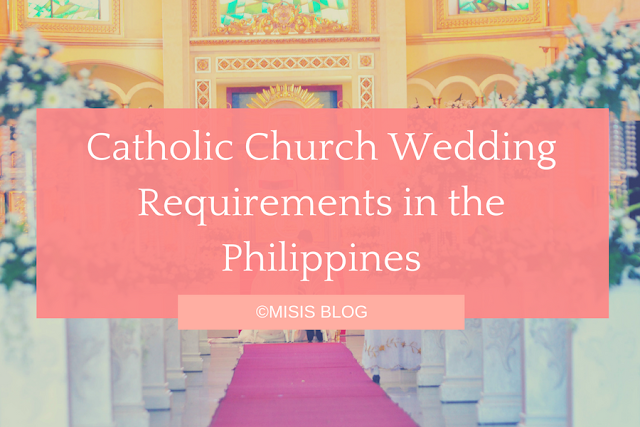 Here's a quick guide on everything you need to know about the requirements for applying for a Catholic wedding. Marriage license. If previously married, marriage certificate. Note: This list is based on the requirements from Cebu City, specifically the Archdiocesan Shrine of St. Therese of the Child Jesus in Lahug. The validity of the church requirements was not explicitly mentioned to us, but as a rule of thumb, the certificates are said to be valid for 6 months. You may ask your church about this. Since you cannot complete all the requirements for a Catholic church wedding without the marriage license, you may begin processing this at least 3 months prior to your wedding. You may reserve a schedule for your wedding even if you haven't completed your requirements yet. It's best to schedule your wedding at least 3 to 6 months prior to your planned wedding date. You must go to the church office personally to schedule your wedding (no need for you and your partner to go together); they will not entertain calls or e-mails regarding this. To reserve your slot, you must provide 50% downpayment. This depends on the church. Ours was roughly 10,000php for the wedding, so the downpayment was 5,000php. Your Parish church. By Parish church, this means the church where you were baptized, regardless of whether you moved to another place after your baptism. Depends on the church. Prepare roughly 100php per copy. You can just wait for this. But if the priest isn't available to sign, you may want to go back the next day. Note that you only need 1 copy of the baptismal certificate. The church will collect the original copy upon submission. No photocopies required. The church where you were confirmed. If you haven't been confirmed yet, you only need to present a photocopy of your baptismal certificate (with "for marriage purposes" annotation) to apply for confirmation. If you haven't been confirmed yet, roughly 250php all in all (150php for the registration and 100php for the certificate). The registration fee is inclusive of 1 sponsor/witness. For additional sponsors, you pay roughly 150php each. Note that you only need 1 sponsor. If you've already been confirmed, you can just wait for the certificate. But if the priest isn't available to sign, you may want to go back the next day. If you haven't been confirmed, it takes about 3-5 working days for your certificate to be released. Note that you only need 1 copy of the confirmation certificate. The church will collect the original copy upon submission. No photocopies required. The confirmation does not need to be in the same church you've been baptized. You can have your confirmation, if you haven't done so yet, in the same church you plan to have your wedding. The church where you plan to get married will issue 2 marriage banns: one for you and one for your partner. Either they will mail this to the address of your Parish church, or they will give the marriage banns to you for you to hand-carry to your Parish church. Marriage banns is a piece of paper that notifies the public of your upcoming wedding. This will be announced to your Parish church for 3 consecutive Sundays. The purpose of the marriage banns is to clarify whether your planned marriage has no impediments. After the announcements, either your Parish church will mail the results to the church where you plan to get married, or you will go to the Parish church to claim the results and hand-carry it to the church of your wedding. Impediments to a marriage includes, but not limited to the following: a previous marriage wherein the spouse is still alive or if the marriage has not been anulled; you and your partner are relatives; you and your partner are of the same gender; etc. If you're a paranoid bride like me, an old flame who simply does not want your marriage to push through is not an impediment. Depends on the church. Prepare roughly 1,500php per copy. This is also called a Jurisdictional Permit. Note that you only need 1 copy. The church will collect the original copy upon submission. No photocopies required. This is only needed if your wedding is to take place in another church. Depends on the church. But usually, this is for free. Depends on the church. There is usually a monthly schedule for canonical interviews. The interview lasts roughly 2 to 3 hours. The canonical interview is done on the nearest schedule to your wedding date, usually 1-2 weeks prior. There is usually a monthly schedule for everyone; no special schedules. But this depends on the church. You will be given questionnaires prior to your interview: one for you and one for your partner. You need to fill this up prior to your scheduled interview. The questionnaire covers basic questions about the Catholic principles on marriage, marriage impediments, list of principal sponsors, and some personal information. Depends on the church. Prepare roughly 250php per couple. Depends on the church. Ours took the whole day. Other churches schedule the seminar for 1 to 2 days. You will immediately be given a certificate after the seminar. The pre-cana seminar is done on the nearest schedule to your wedding date, usually a month prior. Any church, but preferably the church where you plan to get married. Note that this is entirely up to you and your conscience; your attendance will not be listed after you confess. The church advises to do this a week or a few days before your wedding date. Some churches ask for a copy of your wedding invitation, just to make sure all the names of the sponsors are spelled correctly. This is submitted together with all the other wedding requirements. I created a separate post for this. For more information, check out Marriage License Requirements in the Philippines.